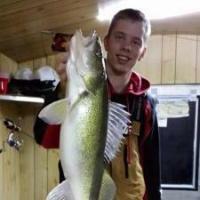 Enjoy the Lake Winnibigoshish fishing reports. Current reports can be found by clicking the highest numbers on the upper right for this thread. Looking forward to seeing your fishing reports and pics here too. Last weekend due to mobility, that kind of fishing was slow. If you were able to get off the roads, you did better. A snowmobile is a big plus. We fished anywhere from 20' to 36 ft. Fish at all depths. As BMC said that was the way last weekend. We were graphing fish most of the day, but they would come up and take a look and then disappear.Some would hit but most did not. Tried various sizes and colors. We were very limited in where we could go. Next time sleds have to come with. Could not get to spots we wanted to, because of the snow. The GPS will help ya a lot. It will amaze you. Say Hi to Ben at the GDP for me. I couldn't believe the water clarity up there. We could see bottom in 22' of water. I was looking down the hole to see how far down I could see my sucker minnow, and saw a beer can on the bottom. Baitfish on the graph all day, when they would disapper, we'd get a good mark on the graph, but all it would do is sniff and leave. Just curious as to exactly how much snow there is on the lake (average depth) and how much slush is underneath. I'm coming up soon at the info will help me plan the snowmobile and waterproof boots agenda. I've had several people ask me about the slush under the snow and I will say, that besides for the plow banks, I have not seen any water where I've plowed. the water does come up any holes we drill still, but I block the houses and then bank them before I drill. this keeps the water basicly inside and not flooding the area. the water seems to come up about an inch or so, not shooting up. once away from the plow banks, I can pretty much plow where ever I want, but there are areas where the rough ice is piled up in large areas. ouch. if you bring a wheel house up try to find someone to open up a spot for you. if you set up to close to the roads, we will be flooded out and will have to close roads. I am more than willing to help out if you catch me on the ice. I can even help choose a spot with the gps. I am finding a lot of new to winnie people this year. I sure hope they get on fish. that's the part that makes or breaks an anual trip. they say the fish are just a bonus, but I know the real deal. that's why I work hard to promote winnie. it's a great fishery. it's been real easy to find and catch fish the last few years, but this year it's making us work a bit harder. Hey Jigglestick, Are you all making good headway out there? I pre-fished one house yesterday and it was bunk. I didnt check my depth with the vex and found myself in 28 feet of water. I like shallower. we did have some perch bites, but no game fish. I might move it shallower in the morning. got sidetracked with another venture today. I hate to fall back on the old standby, "the weather shut them down". to me it's just another excuse for a poor outing.it might be true, but I just hate admitting defeat. it's what keeps me pushing on and on to find active fish. were you on the perch bar ? ?/ prefishing?? spawning areas?? we will have another 18 inches of ice or more before it's done. it's the second week in january. maybe that's what I'm doing wrong. I was out by the perch bar and with out giving out to many details, I have somewhere between 2 and 8 houses out. just look for my plow truck or ask around for my phone number if you need or want some help. I can not post contact info here, sorry. 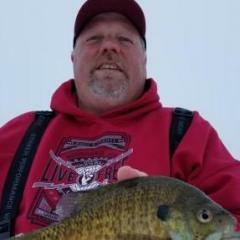 Four of us were up at High Banks on Fri,Sat with the wheelhouse caught 8 walleys released 1 that was 20 inches,we also caught 13 perch and let some smaller ones go.We had a good time thanks High Banks was our first trip to winnie. myself and 6 guys were up friday thru yesterdy. We got a few perch, and a few walleyes. Most of the walleyes were eaters which was great. We let go maybe 4 or 5 that were too small, and equal that in ones that were too big. 24.5 was the biggest. A couple nice pout were caught as well, so thats always a bonus. GREAT TRIP>>> THANKS HIGHBANKS!!! Pat I caught that 26 in pout that day I saw u at highbanks. Nicely done, i love those things... Anything else? I am new to this so you will have to bear with me. I am goin to the big lake tomarrow and will be back on sunady. staying at Nodak and the people there are great. it sound like the perch bite is doing ok. and i hope our group will do as good as we do every year. 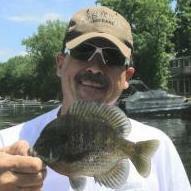 we have been going up the same weekend every year since they had the 100 perch limit. there has been years that our group was stuck to no travel witch would discurage every one. but if your a full blooded ice fisherman even if you don't have a sled you will do what it takes to get on the fish. So in all i hope it is a good year put all of the drinking aside and save it untill you get on the fish.I hope this doesn't offend any one but lets giver the beans and make it a good time. I will try to post pictures from the trip after we return. One last tip i have (or the only tip) is if you are looking for perch, " the shanty towns are not the way to go." so many lines and not enough fish to go around. at least if you are by your self you can jump around holes to stay on top of them. Like people say stay don't flood the roads because a good spot you had the day before may not be so good when you can't get to it the next day and the lodge's don't need to work more then they have to they do a great job to keep all of us satisfied as it is (tipping tem is great). fished winnie yesterday. kept 2 13" eyes, 12 perch 9-11 inches and two snutes. threw back a 20" eye and 5 under 10". very light biters except for the 20". he came in to the jig, looked at it, then i heard the bobber on the deadstick go down. he nailed that thing. you could barely feel the bite from the eyes that i caught with a green weasel spoon. when i marked them on the vex, i would lift the jig up real slowly and they would follow it up about a foot or so and all of a sudden you would feel just a little extra weight. set the hook and they were on. punched about 40 holes to find perch. marked fish just about everywhere but they didn't want to eat real bad. still had a nice day on the ice. mild with no wind. What time of day did you catch the perch and were you on top of a hump or at the base (mud) or maybe fishing the main shoreline breaks?